Justice Minister Ayelet Shaked (Jewish Home) spoke out Tuesday morning in response to rumors elements within the Likud are attempting to lure her away from the Jewish Home party and recruit her as a potential future candidate for the premiership after Binyamin Netanyahu retires from politics. 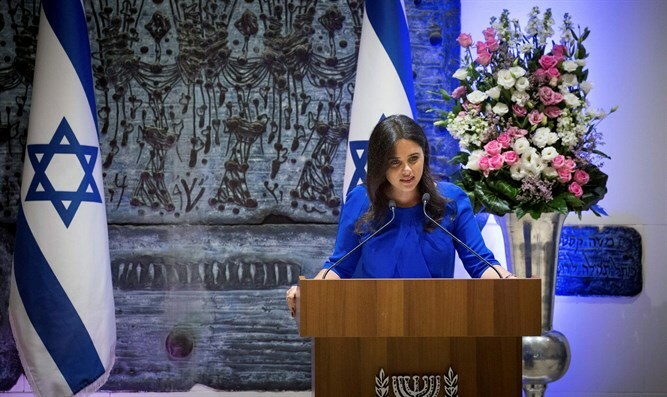 Shaked said explicitly Tuesday that she had no intention of bolting the Jewish Home, and would only consider a run for Prime Minister after party chief Naftali Bennett had done so himself. “Bennett and I work well together. He knows that I’m not going to surprise him like this or in any other fashion,” said Shaked. Recently, Australian Jewish mining mogul and Likud donor Joseph Gutnick, who helped fund Netanyahu’s 1996 campaign, endorsed Shaked for the premiership when incumbent Prime Minister Binyamin Netanyahu retires from politics. Netanyahu, who turns 69 in October, has hinted that he will run for a fifth term as premier when the current Knesset’s term ends in 2019, then possibly retire from politics. If Netanyahu is reelected in 2019, and serves out an additional four-year term, he will be 74 by the end of his fifth term. “I would really love to support her as the [political] heir of Netanyahu,” Gutnick told Maariv. Jewish Home chairman Naftali Bennett, Gutnick argued, must step aside and let Shaked run for the premiership. “He needs to step aside and not be selfish." Gutnick’s comments come amid rumors that senior Likud officials have been encouraging Shaked to bolt the Jewish Home for the Likud. A Knesset poll last week suggested Shaked would be a viable candidate for the premiership, and would win as many seats as leader of the Likud as Prime Minister Binyamin Netanyahu would if new elections were held today. On Monday, Bennett responded to the poll, and speculation about a possible run by Shaked for Prime Minister.